Italy; Middle 15th Century. Latin Text; Rotunda Book Hand, square notations. 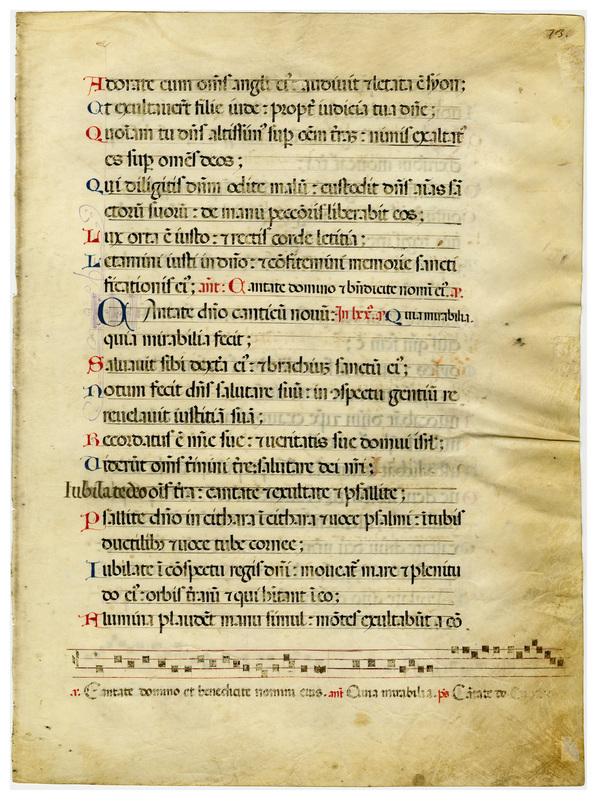 This Psalter was written by Carthusian monks. Of all the orders the Carthusian was the smallest and most austere. The membership never exceeded one per cent of those enrolled in the combined monastic orders. The Carthusians were frequently hermits, and manuscripts written by them are rare. The rotunda book hand used in this leaf is representative of the general excellence maintained by Italian scribes at the time when printing was being introduced into their country. The simple melody for the Psalms apparently was added at a somewhat later date. Close observation of the initial letters will frequently reveal a small black letter inserted as a guide for the monk who later added the color initial. The use of two guide lines for the lettering is unusual. Ordinarily one line, below the writing, was deemed sufficient. The lines were drawn with a stylus composed of two parts lead and one part tin. The vellum of this leaf is yellowed with substantial wrinkling around the edges. The lining has been done in ink, with black for the primary text (showing indications of wear) and red, blue, and purple in the decoration. This leaf is not illuminated, but decorative details include large and small red and blue initials. The large initials have a purple interior and exterior line decoration as an accompaniment. Text: Psalms 96:7-12 and Psalms 97:1-9 (recto); Psalms 97:9, Psalms 98:1-9, and Psalms 99:2 (verso). Adore him, all you his angels: 8 Sion heard, and was glad. And the daughters of Juda rejoiced, because of thy judgments, O Lord. 9 For thou art the most high Lord over all the earth: thou art exalted exceedingly above all gods. 10 You that love the Lord, hate evil: the Lord preserveth the souls of his saints, he will deliver them out of the hand of the sinner. 11 Light is risen to the just, and joy to the right of heart. 12 Rejoice, ye just, in the Lord: and give praise to the remembrance of his holiness. ...of the Lord: because he cometh to judge the earth. He shall judge the world with justice, and the people with equity. The Lord hath reigned, let the people be angry: he that sitteth on the cherubims: let the earth be moved. 2 The Lord is great in Sion, and high above all people. 3 Let them give praise to thy great name: for it is terrible and holy: 4 and the king's honour loveth judgment. Thou hast prepared directions: thou hast done judgment and justice in Jacob. 5 Exalt ye the Lord our God, and adore his footstool, for it is holy. 6 Moses and Aaron among his priests: and Samuel among them that call upon his name. They called upon the Lord, and he heard them: 7 he spoke to them in the pillar of the cloud. They kept his testimonies, and the commandment which he gave them. 8 Thou didst hear them, O Lord our God: thou wast a merciful God to them, and taking vengeance on all their inventions. 9 Exalt ye the Lord our God, and adore at his holy mountain: for the Lord our God is holy. Sing joyfully to God, all the earth: serve ye the Lord with gladness. Et exsultavérunt fíliæ Judæ propter judícia tua, Dómine. Quóniam tu Dóminus altíssimus super omnem terram; nimis exaltátus es super omnes deos. Qui dilígitis Dóminum, odíte malum: custódit Dóminus ánimas sanctórum suórum; de manu peccatóris liberábit eos. Lux orta est justo, et rectis corde lætítia. Cantáte Dómino cánticum novum, quia mirabília fecit. Salvávit sibi déxtera ejus, et bráchium sanctum ejus. Notum fecit Dóminus salutáre suum; in conspéctu géntium revelávit justítiam suam. Recordátus est misericórdiæ suæ, et veritátis suæ dómui Israël. Vidérunt omnes términi terræ salutáre Dei nostri. Jubiláte Deo, omnis terra; cantáte, et exsultáte, et psállite. Psállite Dómino in cíthara; in cíthara et voce psalmi; in tubis ductílibus, et voce tubæ córneæ. Jubiláte in conspéctu regis Dómini: moveátur mare, et plenitúdo ejus; orbis terrárum, et qui hábitant in eo. -spéctu Dómini: quóniam venit judicáre terram. Judicábit orbem terrárum in justítia, et pópulos in æquitáte. Dóminus regnávit: irascántur pópuli; qui sedet super chérubim: moveátur terra. Dóminus in Sion magnus, et excélsus super omnes pópulos. Confiteántur nómini tuo magno, quóniam terríbile et sanctum est, et honor regis judícium díligit. Tu parásti directiónes; judícium et justítiam in Jacob tu fecísti. Exaltáte Dóminum Deum nostrum, et adoráte scabéllum pedum ejus, quóniam sanctum est. Invocábant Dóminum, et ipse exaudiébat eos; in colúmna nubis loquebátur ad eos. Custodiébant testimónia ejus, et præcéptum quod dedit illis. Dómine Deus noster, tu exaudiébas eos; Deus, tu propítius fuísti eis, et ulcíscens in omnes adinventiónes eórum. Jubiláte Deo, omnis terra; servíte Dómino in lætítia. 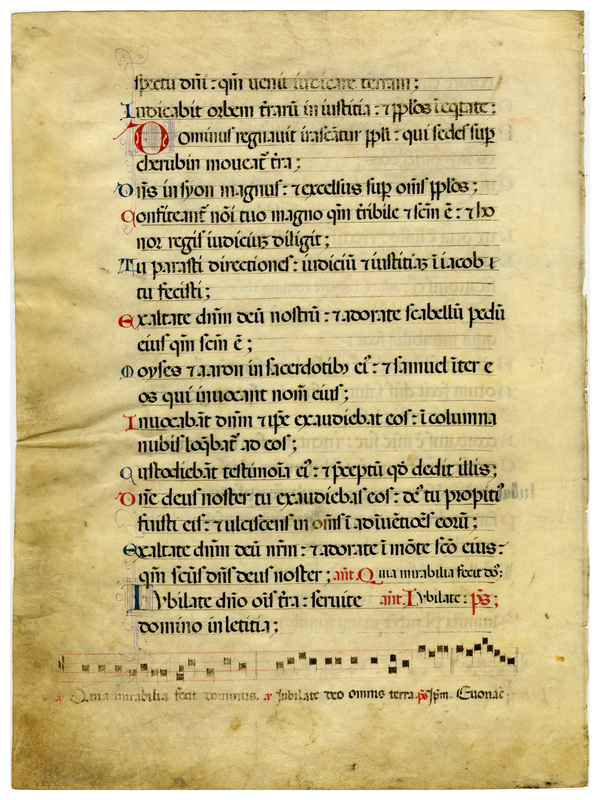 “E0034 Leaf from a Psalter (Psalterium),” Digital Exhibits | Denison University Archives & Special Collections, accessed April 23, 2019, http://exhibits.denisonarchives.org/items/show/54.